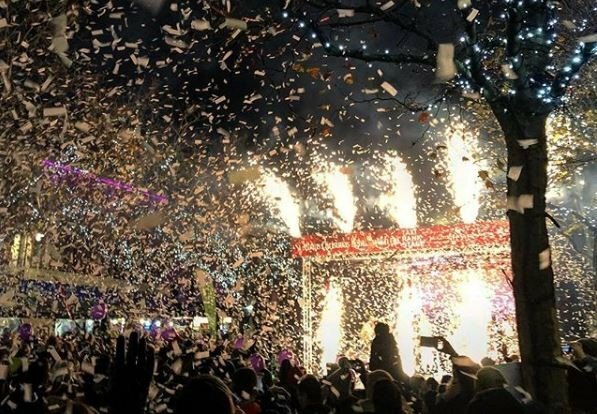 Confetti Magic teams were out in force for busy weekend making it snow and lighting up town and city centres with pyrotechnics to mark the start of the Christmas season. 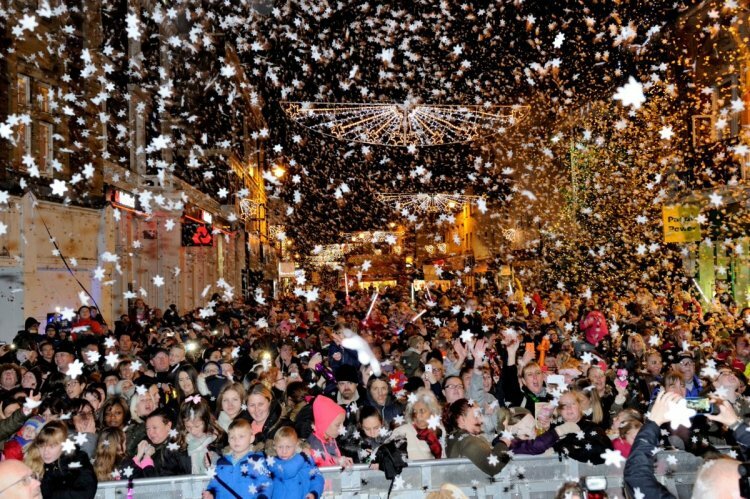 Up and down the country, our teams were on hand to cover thousands of visitors in snowflakes, confetti and streamers as the Christmas lights were switched on. Dartford Borough Council requested a high impact show for the moment the lights were switched on and something to entertain the crowds leading up to the main event. This is where our T-shirt launchers came into their own. Filled with a combination of marshmallows and logo bugs, the compère fired volleys of sweet treats into the audience whilst our C02 jets sent plumes of white vapour into the air around them. For the main event, we used both our CO2 and fan powered confetti blasters to create a blizzard of snowflake shaped confetti with a volley of metallic streamers as the lights came on. At the same time, Sloan Square filled the streets with a mixture of white tissue and fully biodegradable silver confetti and in Pontypridd, South Wales with more stadium blasters, remote control streamer cannons and a huge aerial fireworks display designed with large calibre shells only to ensure they could be seen over the nearby buildings. The following day saw a huge turnout at Exeter City Centre hosted by local radio station Radio Exe with yet more white confetti while St Albans celebrated with a combination of our multi-shot remote control streamer cannons and stage pyrotechnics to create a visual countdown, all trigged by our brand new VIP button. A very successful weekend for us all with thousands of happy faces, despite the cold weather.